Who is Yeshua? Yeshua is the same as Jesus Christ of the New Testament Bible, and the same as the Messiah which was prophesied to come through the Jewish people over and again in the Old Testament Bible which is known as the Tanakh to the Jews. Why do people call Yeshua ‘Jesus’? The name “Jesus” comes from the Latin Iesus, which comes from an Anglicized form of the Greek name Yesous. What this means is that the Greek name Yesous was altered as it was adopted by the English language. In the 1st century the Greek name Yesous represented the Hebrew name Yeshua, which was a shortened form of the Hebrew name Yehoshua. Despite claims to the contrary, there is no historical or linguistic basis in any biblical texts for other modern forms of the name Yeshua, such as Yahshua, Yahushua, Yeshu, or Y’shua. The name ‘Jesus’ did not yet exist during the the time that Jesus Christ was on Earth, approximately 4 BC to 29 or 34 AD. It did not come into existence until it was configured by the Council of Nicea of the Roman Catholic Church in the 4th century. The first part is the “prefix” form of the Tetragrammaton—God’s Four-Letter Name: Yod-He-Vav-He or YHVH.In the Hebrew Bible “Yeho-” is used at the beginning of certain proper names: Jehoshaphat, Jehoiachin, Jehonathan (In Medieval English the letter “J” was pronounced as “Y”). The “suffix” form of the Tetragrammaton is “-yah” (“-iah” in Greek, as in Isaiah, Jeremiah, Zechariah, or Halleluiah). The second part is a form of the Hebrew verb yasha which means to deliver, save, or rescue. Symbolically, the name Yehoshua/Yeshua/Jesus conveys the idea that God (YHVH) delivers or saves (his people). Some have suggested that the name Yeshua can be found hidden within the tetragrammaton YHVH, as “Yeshua HaNazarei Vemelekh HaYehudim” which in Hebrew translates as, “Jesus of Nazareth, King of the Jews” which is the same as the familiar Latin inscription INRI seen written on the notice that was nailed to the cross above Jesus per Pontius Pilate’s instruction, “Iesus Nazarenus Rex Iudaeorum”. However, Hebrew linguists are reluctant to state that this is the case, because the word “Ha” translates as “The”, so the ‘Ha’ could be referring to anything. Point taken, but it is interesting none the less, especially in light of what YHVH means and what Jesus said about himself. YHVH, pronounced Yaweh, was first used in the Bible in Exodus 3:14 as the name of God when God spoke to Moses from the burning bush. 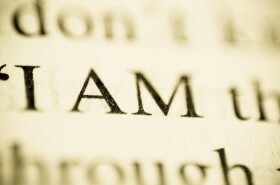 YHVH translates as “I AM THAT I AM” or “I AM WHO I AM”. John 8:23: And He said to them, “You are from beneath; I AM from above. You are of this world; I am not of this world. John 10:36: “do you say of Him whom the Father sanctified and sent into the world, ‘You are blaspheming,’ because I said, ‘I am the Son of God’? John 11:25: Jesus said to her, “I AM the resurrection and the life. He who believes in Me, though he may die, he shall live. John 15:1: “I AM the true vine, and My Father is the vinedresser. The I Am In the Old Testament was whatever man needed. He became, he was his all in all. Jesus in the New Testament uses all the examples to show who He is. He is everything to man and the only way to God. The most important of all the statements is in John 8:24 after Yeshua tells them I am not of this world. “Therefore I said to you that you will die in your sins; for if you do not believe that I AM [He], you will die in your sins.” ( the word ‘he’ is not in the original). Yeshua is telling them that he is the same I AM that Moses met at the burning bush.